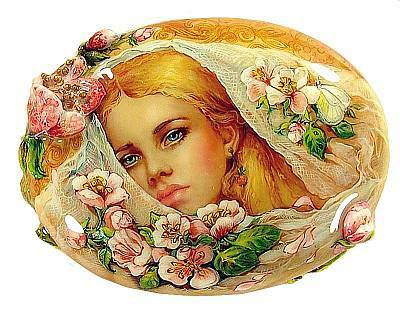 Fedoskino artist Natalya Orlova, whose work is featured in "Russian Lacquer Miniatures: New Visions", has created this sensational two piece work showing a young woman lying among the apple blossoms sometime in the spring. The flowers can be rather ubiquitous during this season, and here some have gently landed on her thin white shawl, as if they have been scattered by the wind and caught by the soft fabric. 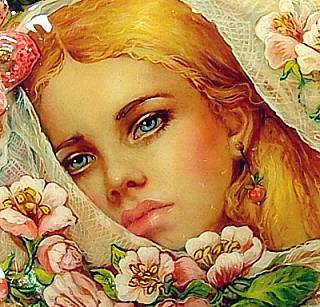 Though at rest now, the girl has been drawn with a certain sassiness to her character (perhaps it is those pouty lips), and her blue eyes are entrancing. The box sits on a base which is shaped like a leaf, and the flowers and leaves on both the box and the base are delicately sculpted in relief. When you open the box, time moves forward several months, and you will see the result of the springtime activity. 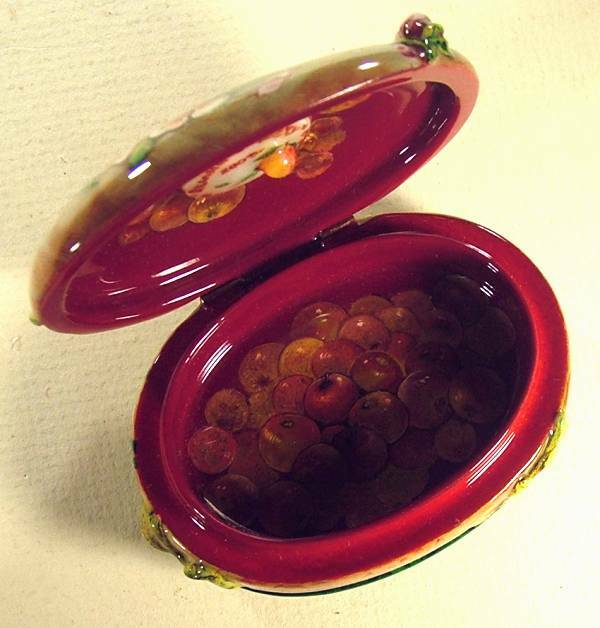 In addition to the apples that you see there, the artist also placed four little pearls, painted to resemble apples, on both the bottom of the box and base, which act as little legs. (It may sound corny, but it looks quite beautiful!) 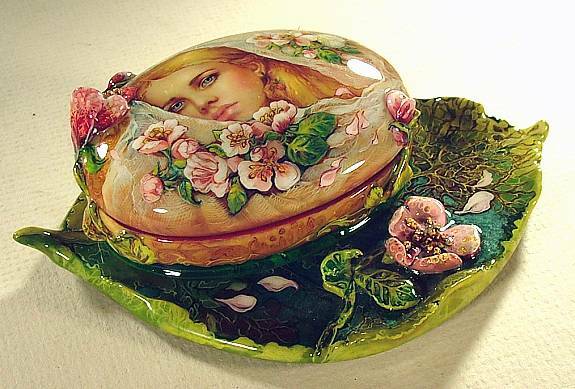 The artist also put a circular piece of mother of pearl under the lid and signed the box with her name, village, title and year. Both the box, which has a hinge, and base are made out of high quality papier mache. A truly unique work that grows on you with each viewing. Note: For those interested in Russian culture and music, there is a very famous song that has the same name of the box, and wistfully compares this time of year to the time of one's youth. You can hear the song at youtube by clicking this link.